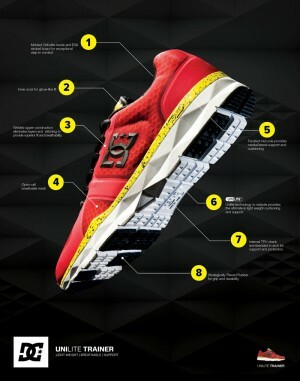 DC’s new Unilite Trainer is the first training shoe created from the insights of the action sports athlete. 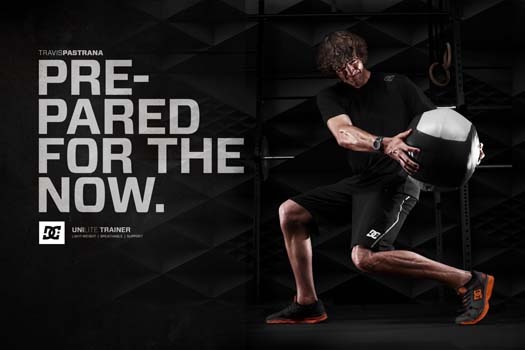 Designed to enhance each athlete’s training experience, this lightweight trainer provides support, comfort and breathability. The Unilite Trainer features a lightweight midsole/outsole designed and developed for cushioning, stability and traction as well as a full-length molded Ortholite sockliner for instep comfort and moisture wicking. The upper consists of a welded external construction for support and full inner bootie for comfort and breathability. The first trainer by DC, this innovative and technologically advanced shoe was designed to bring DC athletes to the next level. Available as part of the Fall 2012 DC Mens and Womens footwear collections, the Unilite Trainer will be offered in four colorways for both men and women, as well as a limited edition Travis Pastrana and Trey Canard signature model for men.